The quidditch games are some of the things that Hogwarts is most famous for (aside from all the "witchcraft and wizardry" stuff). The students and faculty get such a thrill out of cheering for their house's team and watching the players zip around and pull off incredible, death defying stunts on their broomsticks, while they try to score points and keep the other team busy while their Seeker keeps an eye out for the Golden Snitch! The game can also be pretty dangerous, so it's no surprise that safety is important. And while spells and incantations are helpful, there's still no substitute for good old fashioned safety gear, like this licensed Quidditch Accessory Kit, to make your little quidditch fan look ready to fly into the game! 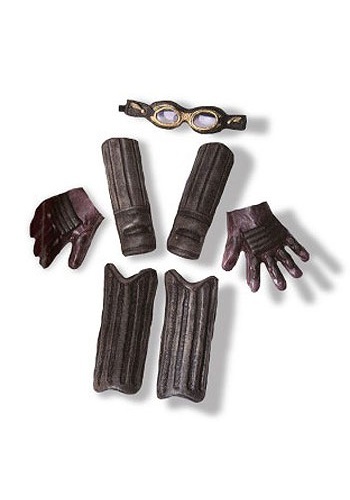 Add this dashing, faux leather set of gloves and guards to their quidditch robes to make your kid look just like Harry Potter and his daring teammates, and the matching goggles will help them track down that pesky Snitch. We just hope your little witch or wizard has passed their broom pilot's test!